در اکثر فعالیت­های حرکتی، بیش­از یک گروه عضلانی درگیر هستند، لذا در روش­های بازتوانی حرکتی، در طول زمان حرکت، فرد باید بتواند هماهنگی لازم را به بین زمان و شدّت فعّالیّت عضلات درگیر، ایجاد نماید. عملکرد حرکتی نوشتن یا ترسیم، ازجمله عملکردهای حرکتی قرار دارد که بیش­از یک گروه عضلانی را درگیر می­کند. در دسته­ای از بیماری­ها مانند دسته­ای از افرادی که مبتلا به فلج غیرکامل نخاعی یا تنگی کانال کارپال هستند، ممکن است عضلات ساعد سالم باشند، امّا عضلات انگشتان به طور خاص عضلات انگشت شست، دچار فلج نسبی یا مطلق باشد. لذا برای بازتوانی چنین حرکتی، باید الگوی هماهنگی مربوط به نحوه­ی فعّالیّت عضلات ساعد و انگشت شست برقرار شود. 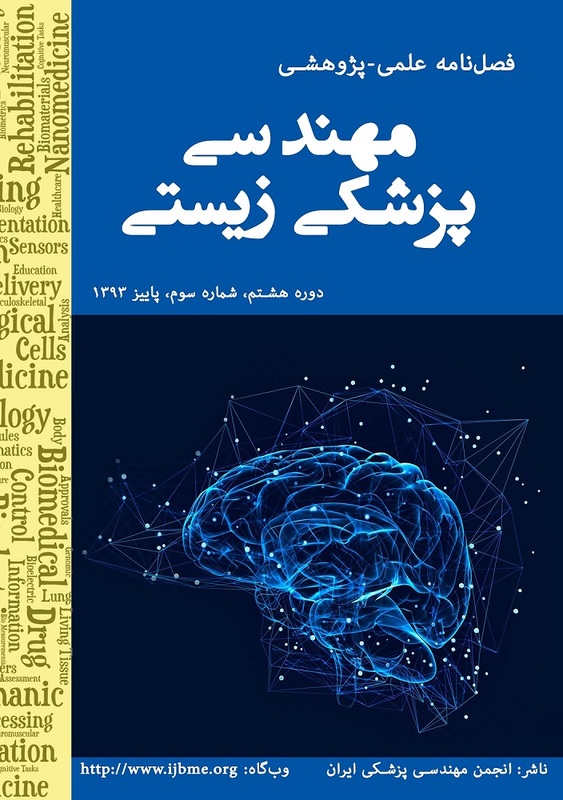 درین تحقیق، یک مدل پیش­بین مبتنی بر شبکه­های عصبی برای روش شناسایی الگوی سینرژی بین دسته­ای از عضلات ساعد و انگشت شست دست، حین فرآیند رسم شکل و نوشتن حروف ارائه شد. به طوری که ورودی شبکه­ عصبی مصنوعی، الگوی فعّالیّت عضلات بازکننده و جمع­کننده ساعد است، درحالی که خروجی شبکه­ی عصبی مصنوعی، الگوی فعّالیت مطلوب عضلات بازکننده و جمع­کننده انگشت شست دست را پیش­بینی کرد. ابتدا سیگنال­های الکترومایوگرام عضلات ساعد و انگشت شست ده فرد سالم، حین نوشتن چهار حرف انگلیسی و رسم یک دایره ثبت شد. سپس، با استخراج الگوی فعّالیّت عضلات از سیگنال­های الکترومایوگرام داده­های آموزش شبکه به دست آمد. کارایی پنج شبکه عصبی پرسپترون چند لایه، نارکس، بازگشتی، عصبی/فازی تطبیقی و پایه­ی شعاعی ارزیابی و مقایسه شد. نتایج نشان می­دهد که شبکه­ی­ عصبی نارکس با ساختار سری/موازی در مقایسه با چهار شبکه عصبی دیگر توانست با دقّت قابل قبولی الگوی فعّالیّت مطلوب عضلات انگشت شست دست را پیش­بینی نماید. Multiple muscle groups may be activated simultaneously during the most of activities. So, the appropriate muscle coordination must be emerged during a normal activity. Consequaently, for rehabilitation of movements such as hand writing and paiting in patients for example suffering from carpal channel syndrom or incomplete spinal cord injury, the correct muscle coordination patterns between the finger muscles and wrist muscles must be reestablished. So, in this paper a prediction methodology based on artificial neural networks (ANN) is proposed to approximate the Thumb fingure extensor and flexor muscles desired activation pattern during the hand writing and Painting. In the presented strategy, A nonlinear auto-regressive neural network (NARX), Recurrent Neural Network (RNN), Radial Basis Function (RBF), Multy Layer Perceptron (MLP) and an Adaptive-network-based fuzzy inference system (ANFIS) are trained to forecast the Extensor pollicis longus and Flexor pollicis brevis muscles activity of one thumb finger of hand using Extensor carpi radialis brevis and Flexor carpi ulnaris muscles activity of forearm. Quantitative evaluations show the promising performance of developed neural networks. Eight healthy volunteers participated in the experiments. س. احمدزاده، ح. کبروی. ع. شعیبی، ز. طالب زاده، "پیش­بینی الگوی سینرژی عضلات دست درگیر حرکت نوشتن با استفاده­از شبکه­های عصبی مصنوعی" اولین کنفرانس ملی مهندسی برق و کامپیوتر، 1391. س. احمدزاده، ح. کبروی. س. طوسی­زاده، ز. طالب زاده. "شناسایی دینامیک فعّال­سازی عضلات بازکننده و جمع کننده انگشت شست هنگام عملکردهای حرکتی دست با شبکه­های عصبی مصنوعی" بیستمین کنفرانس بین­المللی مهندسی زیست پزشکی، 1392. J. L. Lujan, P. E. Crago, “Computer-based test-bed for clinical assessment of hand/wrist feedforward neuroprosthetic controllers using artificial neural networks” Medical & Biological Engineering & Computing Vol 42, pp 754-761, 2004. C. Castellini P. V. D. Smag, “Preliminary evidence of dynamic muscular synergies in human grasping” The 15th International Conference on Advanced Robotics pp 28-33, 2011. M. Liu, T. Liu, and G. Wang “A Compact Representation of Handwriting Movements with Mixtures of Primitives” IEEE Proceeding 1629-1634, 2010. Y. P. Ivanenko, R. E. Poppele, F. Lacquaniti, “Motor Control Programs and Walking” The Neuroscientist, A review, Vol 12, No 4, pp 339-348, 2006. M. Chen, Q. B. Wang, X. X. Lou, K. Xu, X. X. Zheng, “A Foot Drop Correcting FES Envelope Design Method Using Tibialis Anterior EMG During Healthy Gait With A New Walking Speed Control Strategy” IEEE Proceeding pp 4906-4909, 2010. H. Bezine, A. M. Alimi, N. Derbel, “Handwriting Trajectory Movements Controlled by a Bêta-Elliptic Model” IEEE Proceeding 2003. E. Engeberg, M. Frankel, S. Meek, “Biomimetic Grip Force Compensation Based on Acceleration of a Prosthetic Wrist Under Sliding Mode Control” IEEE Proceeding 210-215, 2008. S. D. Iftime, L. L. Egsgaard, M. B. Popovic, “Automatic Determination of Synergies by Radial Basis Function Artificial Neural Networks for the Control of a Neural Prosthesis” IEEE Proceeding vol 13, pp 482-489, 2005. J. K. Shim, A. W. Hooke, Y. S. Kim, J. Park, S. Karol, Y. H. Kim, “Hand writing: Hand pencontact for cesynergiesin circle drawing tasks” ELSEVIER vol 2249-2253, 2010. J. Li, Z. J. Wang, J. Eng, M. J. McKeown “Bayesian Network Modeling for Discovering “Dependent Synergies, Among Muscles in Reaching Movements” IEEE Proceeding, vol 55, pp 298-310, 2008. I. Chihi, C. Ghorbel, A. Abdelkrim, M. Benrejeb “Parametric identification of handwriting system based on RLS algorithm” Automation and Systems pp 1564-1569, 2011. B. Mijovic, M. B. Popovic D. B. Popovic, “Synergistic control of forearm based on accelerometer data and artificial neural networks” Brazilian Journal of Medical and Biological Research pp 389-397, 2008. S. B. Thies, P. Tresadern, L. Kenney, D. Howard, J. Y. Goulermas, C. Smith, J. Rigby, “Comparison of linear accelerations from three measurement systems during” Reach & Grasp, Medical Engineering & Physics pp 967-972, 2007. P. S. Thomas, M. S. Branicky, A. V. D. Bogert, K. Jagodnik, “FES Control of a Human Arm Using Reinforcement Learning” 2007. M. Popovic, D. Popovic, “Cloning Biological Synergies Improves Control of Elbow Neuroprostheses” IEEE Proceeding, pp 74-81, 2001. M. Borjkhani, F. Towhidkhah, “Modeling kinematic features of human handwriting using model predictive control” IEEE Proceeding, 2008. G. Huang, D. Zhang, X. Zheng, X. Zhu, “An EMG-based Handwriting Recognition through Dynamic Time Warping” IEEE Proceeding 2010.